When successful composer Richard Rodgers of Oklahoma! 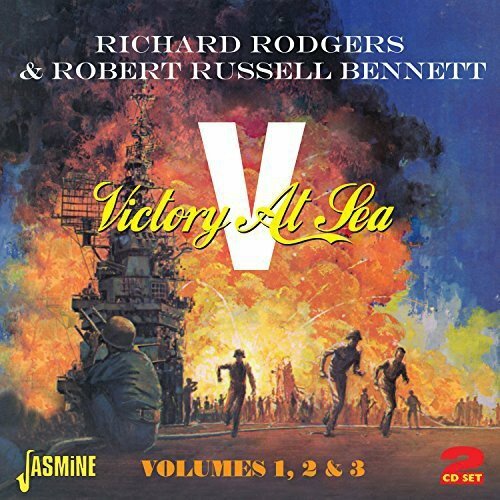 fame teamed up with arranger Russell Bennett to work on the soundtrack for Victory At Sea they gave to the themes, melodies and movements the form and structure of a symphony, a colour and feeling that matched the images on screen perfectly. This collection is a selection of some of the most dramatic moments from the series, there are reminders of the most pivotal battles of WWII, including "Rings Around Rabaul", The Turkey Shoot", "D-Day" and who could not be moved after listening to "Guadalcanal March". Many elements combine to make Victory At Sea simply a 'Must Have' soundtrack to the award winning series with the music possessing an inherent vitality and substance by which it can stand alone as a superb musical experience in itself. Get it now! If you have any questions about this product by Rodgers, Richard & Russell Bennett, Robert, contact us by completing and submitting the form below. If you are looking for a specif part number, please include it with your message.